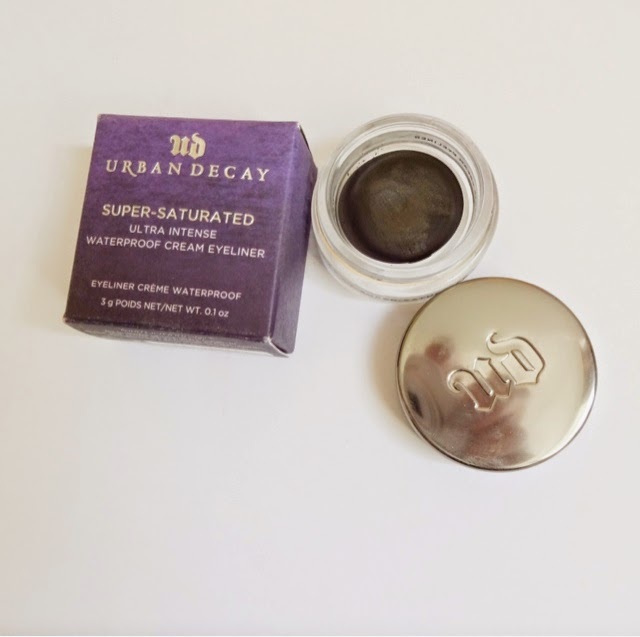 Who doesn’t love a bit of Urban Decay? 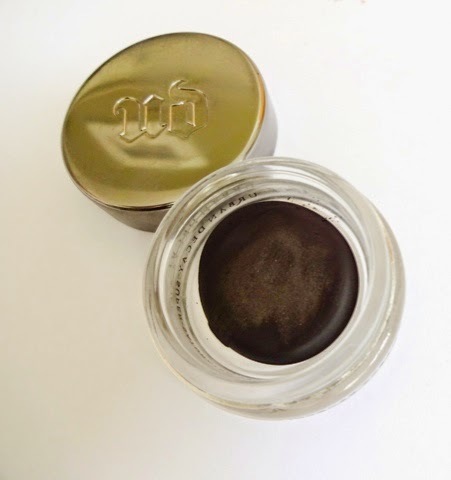 Throughout my teen years they captured my attention with their grungy vibe and sparkly shadows, and since launching their Naked range I have loved them anew. The eye shadows are a byword for quality, and their Naked Skin Weightless Ultra Definition base has become my holy grail. So naturally when I wanted to treat myself to their new cream liner, I was expecting great things. They used to do one called ‘Ink for Eyes’ that was one of the first (and best) cream liners I tried, but the new formulation has sadly fallen a little short for me. First up, packaging. Wowzers, is this gorgeous! A glass pot with the most covetable gunmetal metal lid, embossed with the gothic UD branding. This alone would probably have sold me the product. It looks luxurious, like the kind of eyeliner a Hollywood starlet would use. So, what do they promise for the performance? This sounds like the eyeliner from my wildest dreams. However, something went horribly wrong. I’m convinced the one I got sold was faulty. In the store when I tested this out, it lived up to all those claims and more. Every other blog entry I read praises this to the heavens. But the product I got at home was…well, crap. Literally awful. 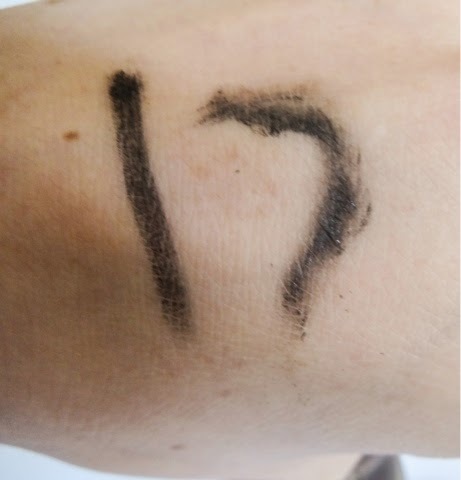 From the very first time I used it, it was dried out and faded looking. I would say perhaps I didn’t screw the lid on tightly enough, only I hadn’t opened it. Majorly disappointed. This was stubborn, hard to blend and a complete let down. You can see from the swatches the performance wasn’t great – and that’s after adding several layers to get it to show up, which would be impossible on the eyes (unless chunky, weirdly misshapen eyeliner lines are your thing). I thought maybe the product had gotten cold in the boot of my car, but when I tried again a few days later it was the same thing, utterly unusable. 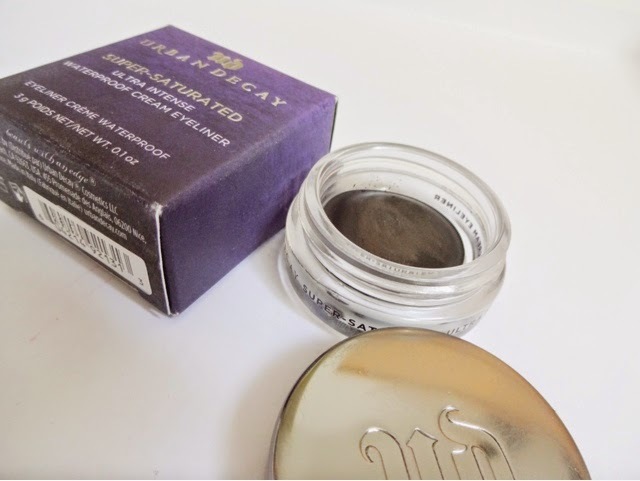 I love Urban Decay so I was really disappointed. I tried contacting Urban Decay on Twitter and Selfridges (where I bought it) via their customer service form on the website, but neither bothered getting back to me. £16.50 isn’t the end of the world, but it’s a fair amount to throw away on something you literally cannot use and I was quite annoyed. I tried a couple of tricks to revive it, including standing the pot in a warm water bath and adding a bit of oil to the pot to change the dried out consistency. The first did nothing, the second just left a stubborn puddle of oil sat on top of the dried out cake of liner. Disaster. In the end, I ended up scraping out the pot, and in the interests of keeping the oh so pretty packaging, de potting the far cheaper Seventeen Smoulder liner into it, which despite being all of £2.50 has comprehensively outperformed the Urban Decay liner on every level. 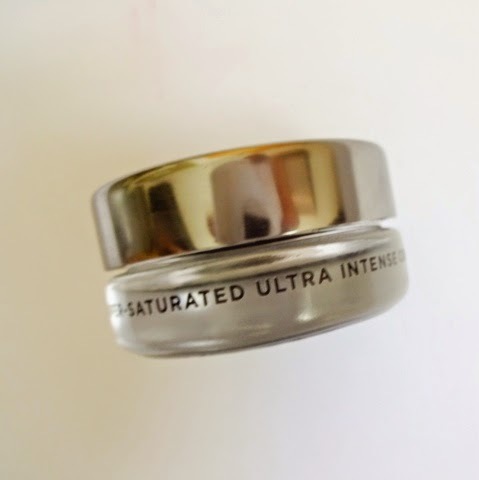 Since then, the Seventeen Smoulder has remained at peak consistency in the UD pot, so I don’t think it can be the pot being a bad design or anything. It must be keeping air out effectively enough. I know this performed well in the store, so I can only think the one I was sold was faulty or a bad batch, but the utter lack of customer care from brand or retailer has put me off quite a bit and dimmed my love for them just slightly. I think ‘normally’ this would be amazing, but I can only go on my own experience which is that Seventeen Smoulder is a far superior buy for much less cash. I basically ended up paying £16.50 for a pretty pot. Not impressed! Have you tried this product – was your experience any better? Do you think I just got a faulty one? What gel liners would you recommend? There is a Maybelline gel liner that I think is my holy grail of liners. The name slips my mind right now, but it comes with a terrible brush that I threw out and used my own brushes. It went on smooth and lasted for hours. I'm terribly surprised that you would have that issue with an UD product. They are known for quality, and those swatches are just terrible. I'm sorry you got a bad one! Hopefully someone will get back to you and you can either get a refund or a whole new pot. I'm almost afraid to even give it a try now. This same problem happened to me with this same product, but I didn't get it directly from Urban Decay, but through Sephora. I emailed their customer service department about it and asked how I go about returning this one in exchange for a new one...a few days later I got an email saying they just shipped a new one and didn't even ask me for the old one! But no, you weren't the only one who received a faulty one. Must have been a bad batch.